1. Relatively easy to use website. It might take a while to get used to, but everything seems to be in a logical place. If you cannot find something, there is a handy search box at the top of each page. Account history is detailed and easy to find. 2. Tons of research tools. These include common stock, preferred stock, closed end fund, exchange traded product (ETFs, ETNs, etc), mutual fund, bond, and option screeners. Most stocks and ETPs have lots of fundamental information (earnings, dividend growth, analyst rating, earnings estimates, all of the commonly used ratios [PE, price/book, etc]). There's also a tool that compares and suggests similar ETPs. You can compare them by fee structure, performance, liquidity, and so on. Fidelity also provides research reports by Morningstar, S&P, Ned David Research, Zach's and others on both stocks and funds (including closed end funds). The options section of the website provides S&P reports for covered calls and calendar spreads on most of the widely held stocks as well as on those S&P thinks provide the best potential return based on the risk. 3. International trading. Fidelity enables its clients to trade foreign stocks in 17 different markets and in 13 different currencies. More information is here. Some things to note are that margin is not available for these transactions, there is no short selling, and order instructions like “all or none” are not available. Commissions are charged in the local currency. At the time of writing the average is around $25 per transaction, or $50 for the round trip. There are also currency exchange fees, which range from 0.2% to 1% of the transaction, depending on the transaction's size. Be aware that foreign stock trading involves not only the risks associated with stock ownership but also currency and political risk. 4. 24/7 live customer support. If you want to talk to customer service on the phone, you can call at any time. In my numerous calls I've never had to wait, whether it was during the trading day or late on a weekend. The phone operators are friendly. I've also found them to be more knowledgeable than representatives at other brokers. If you want to talk to them about a condor or diagonal spread they'll know what you're talking about without having to put you on hold, or quickly transfer you to someone more knowledgeable than themselves. Fidelity is also pretty good at making followup calls to make sure you're satisfied. That doesn't mean you will always be satisfied, but they do try. If you hate the phone, you can use instant messaging. When I tried this feature I had to wait a few minutes before someone responded. Fidelity also responds to email, but as you would imagine this takes longer. 5. Competitive commission rates for domestic trades. Online stock trades are $7.95 while phone orders are $12.95 and representative assisted orders are $32.95. Options are an additional $0.75 per contract (so the total fee for buying one option online, for example, is $8.70). Bond and CD commissions range from none to 2% of investment amount, depending on the type. More detailed information can be found here. Note that the link is a PDF document. If you've been a customer for a long time, have lots of trades (at least hundreds per year), and/or have a large account, Fidelity will offer you lower rates if you ask them. They say that this is determined on a case by case basis, so lower rates are not a guarantee (but it never hurts to ask). 6. ActiveTraderPro. Fidelity has a few pretty good streaming programs: ActiveTraderPro, which you install on your computer, a browser based version, and OptionsTraderPro. They offer streaming quotes, level 2, real-time charting (with many technical analysis tools), complex options orders (which can tell you your max gain and loss), streaming options quotes, and news from around two dozen sources (including Market Watch, Dow Jones, Business Wire, MidnightTrader) that can be set to report only on your holdings or on stocks on your watch list. You can set up a number of watch lists and edit what you want displayed, from your gains and losses, to quantity of shares, to day's and year's price ranges, to options Greeks. The platforms are pretty stable. They disconnect sometimes (the desktop based one is more prone to this) but I haven't had a crash in over a year. Fidelity doesn't charge anything for its streaming platforms, but in order to use them with full functionality you must make at least 120 trades per rolling year. That comes out to $954 per year. 7. Wealth-Lab Pro. This platform allows you to do back testing as well as to design your own trading system (or just use or customize one of the presets). 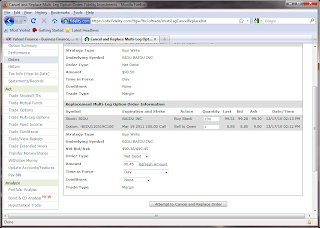 It is available to customers who make at least 120 trades per year and have at least $25,000 in assets at Fidelity. More info is available here. 8. Free dividend reinvestment. You can specify, for your entire portfolio and for individual holdings, whether you want to reinvest the dividends or not. Note that new holdings are automatically set for dividend reinvestment based on the status of the last holding you bought. That is, if you buy a stock and mark it for dividend reinvestment, the next stock you buy will automatically be marked for dividend reinvestment. If you don't want to reinvest dividends in the second stock, you will have to change your preference. If you do so, the next stock you buy will not be marked for dividend reinvestment as a result (so if you want to reinvest the third stock's dividends, you'll have to change your preference for it). 9. Lots of different order types: contingent (if x criterion is met, then y order is placed), multi-contingent (if x happens, and at the same time y happens [or y happens], place z order), one cancels the other (if A order executes cancel order B; if B order executes, cancel order A), and one triggers the other (if x order executes, place this second order). 10. Various different choices for money market accounts, including tax free core cash options. 11. A very wide selection of mutual funds. 13. Fidelity has lots of physical locations if you want to talk to someone face to face or have a professional manage or help you manage your portfolio. 14. Check writing is available. 1. Slow order execution. Suppose you're an active trader. You are watching a very liquid stock or ETF drop and you are fairly certain it will bounce off $50 per share, go past $50.30, and then head below $50. You want to buy 1,000 shares at $50.02 and sell at $50.30. Let's say you're dead on about the stock's movement. In an ideal world you would make $280 minus commissions. More often than not at Fidelity you wouldn't make any money because your order to buy at $50.02 wouldn't be executed. Quite often nothing happens even when a stock trades below your bid. Whether your order is executed often depends on how long the stock you want to buy stays at a certain price. The shorter it stays at a certain price, the less likely your order is to be executed. I've often had my order executed after the stock fell through my bid and returned to it. For example, I wanted to buy something for $100 per share. I placed a limit order for $100 per share when the stock was $100.25. The stock fell to 99.95 per share. My order wasn't filled until after the stock rose back up to $100 per share. This can be very frustrating. (This happens with options orders too, especially if you include "all or none" instructions). 2. Stupid error messages that prevent order placement. Say you place a limit order to buy a stock. As you are doing so, the stock drops below your bid. Any normal broker would just fill your order at the current market price—you were willing to pay more, so you should be happy with a lower price. What usually happens at Fidelity, however, is you receive a message telling you that your bid is higher than the current price of the stock. So you have to change your order lower, but now the stock is higher and in all probability you won't be able to buy it for your originally intended price for the rest of the day, or ever. This problem occurs most frequently with contingent orders (for example, you place two orders at the same time: buy 100 shares of XYZ for $100 per share, and if this order executes, sell 100 shares of XYZ for $102.50. If XYZ is below $100 when you try to place the order, you will get an error message). 3. No execution at all. 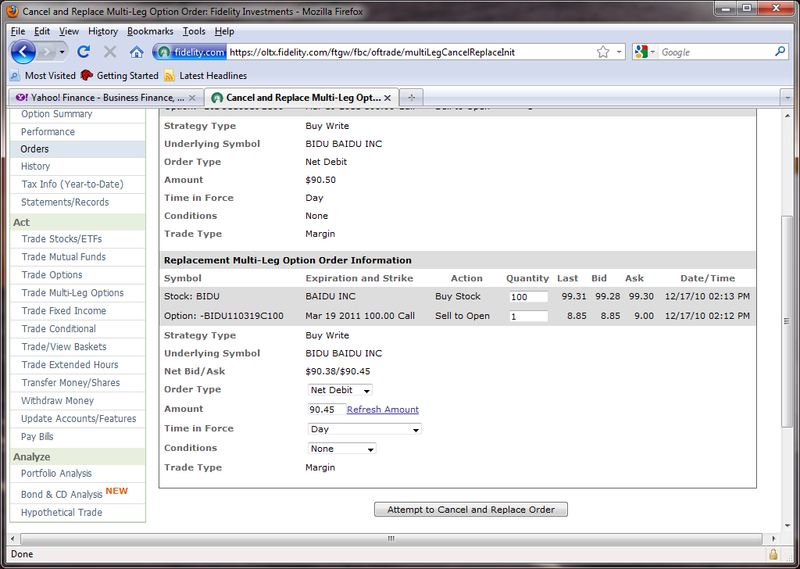 One of the great things about Fidelity is the different multi-leg option orders it offers. The trouble is that these are very rarely executed. 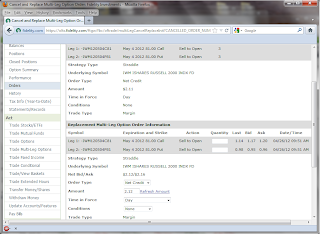 If you are initiating a net debit position, the order ask can be well below your bid and your order still won't be executed. If you're initiating a net credit position, the order bid can be well above your ask and your order still won't be executed. It just hangs there. Fidelity blames the CBOE or the market makers. I don't know whose fault it is, but it really stings when the order is finally executed at your original bid or ask when the current market rate would have given you a better deal. For example, suppose you want to write a covered call by buying 100 shares of stock at $100 per share and selling one call for $5. You want your net debit to be $95 per share. The stock might fall or the call might rise so that the market ask becomes $94.80. One would expect that your order would've been filled by now. Most often it's not. And when it is, even if the ask is $94.80, your order will be filled for $95. This doesn't happen all the time, but it happens enough that it's far easier to just do separate orders—one to buy the stock and one to sell the call. You pay a higher commission, but it's far likelier that your orders will be executed. Here's a screenshot to illustrate. In the screenshot, I'm attempting to buy 100 shares of Baidu and write a call on it of a net debit of $90.50 per share. That is to say, in the screenshot I've placed an order to buy 100 shares of BIDU and sell one call. Now I'm waiting for it to be executed. Notice that the current market bid for BIDU is $99.28 and ask is $99.30. The current market bid for the call is $8.85 and the ask is $9. And again, recall that the order I've already placed is for a total debit of $90.50. If, instead of the multi-leg order, I bought BIDU at market, I'd pay $99.30. And, if instead of the multi-leg order I'd sell the call at market, I'd get $8.85. This would result in a net debit of 90.45. My order is for $90.50--I'm willing to pay $0.05 more than the market ask, but my order isn't filled. Here's another screenshot. Above, I'm trying to sell a straddle on IWM, the ETF that tracks the Russell 2000 index. The net credit I want to receive is $2.11. As you can see in the screenshot, the net bid is $2.12, but my order hasn't been filled. In other words, I'm trying to sell something for $2.11, buyers are offering to pay $2.12, and Fidelity isn't executing my order. This order was never filled. 4. Glitchy order placement and replacement. Let's say you are long or short an option and you want to roll it to a future month. For example, suppose you sold 10 puts that will expire in 30 days and you want to buy these puts back and sell 10 puts of the same strike and on the same stock that will expire in 60 days. 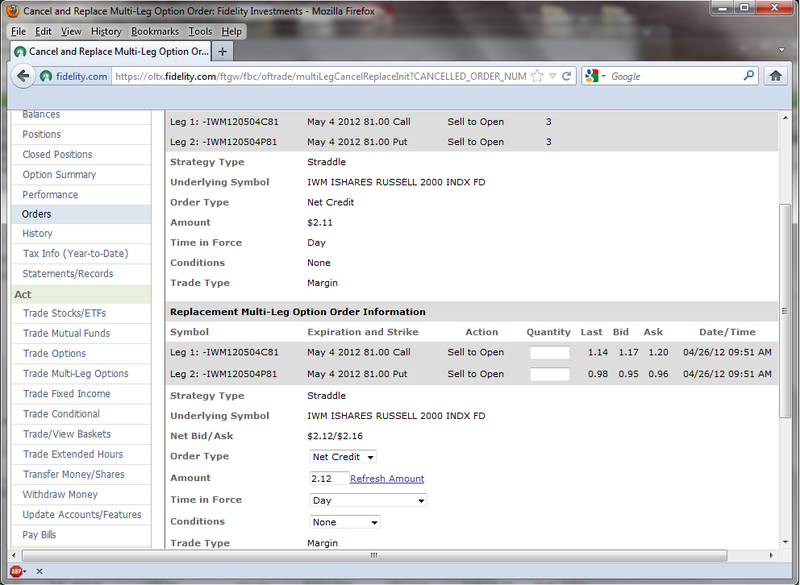 You go to the multi-leg trading screen, select the roll option order, enter in all the information and hit preview. It will work half the time. The other half you'll get a weird error message about how it's an invalid order, one of the option symbols doesn't exist, or something similar. When this happens it is sometimes possible to place the order anyway, the error message notwithstanding. Other times it doesn't let you proceed to the next screen. A way to get around this is to place the order via the spread order screen: in the example above you would buy to close the 10 puts for the front month and sell to open the 10 other puts for the later month. It's the same order, but since you didn't specify that it's a roll, it'll let the order go through just fine. Now let's say something like #3 above happens, where your ask is lower than the current market bid. Let's say you wanted a $1 credit on the roll and the current bid is $1.10. You decide to cancel and replace your order with a credit of $1.10 (because from prior experience you know that if your order is ever executed it will be for $1, regardless of the current market price). You go to the cancel and replace screen. There you have to re-enter the number of contracts you are trading (in our example 10 of each) and your credit/debit (in our example you change the credit from $1 to $1.10). So, in effect, all you are really changing is your net credit in this example. All of the option symbols are already entered for you and you cannot change these even if you want to. Nevertheless, half the time after you hit preview you will get an error message stating that one of the option symbols is invalid or doesn't exist. So you have to either try again (it might work eventually, despite what Einstein said about insanity) or cancel the entire order and start from scratch. There is a similar problem with contingent orders when you attempt to change the trigger price for one of the events. These have been problems for a very long time. Fidelity should be aware of them, as people do complain (I know I have), but so far they've done nothing. If you complain enough someone with a high sounding rank will eventually call to apologize and offer you some free trades. 5. Not many shortable stocks/ETPs. Delta neutral and bearish traders beware. If you short sell stocks and ETFs note that these can be quite limited. For example, while you can almost always short SPY (SPDR S&P 500), you usually cannot short IWM (iShares Russell 2000), even though both are widely held, very liquid ETPs. Most of the widely held stocks can be shorted, but if you are looking to capitalize on a company in trouble, chances are there will be no shares for you to borrow. If your trading strategy involves shorting, look to another broker. With its research tools, bond, stock, ETP, foreign stock, and mutual fund offerings, along with free dividend reinvestment, relatively low commission rates, and good customer service, Fidelity is great for long term investors and infrequent traders. Despite its robust active trading platforms, however, Fidelity isn't very good if you are a frequent trader. There is really no point in having complex option orders and various stock trading tools if your orders are not executed in a timely fashion or for the best price. Fidelity needs to hire some decent computer programers.